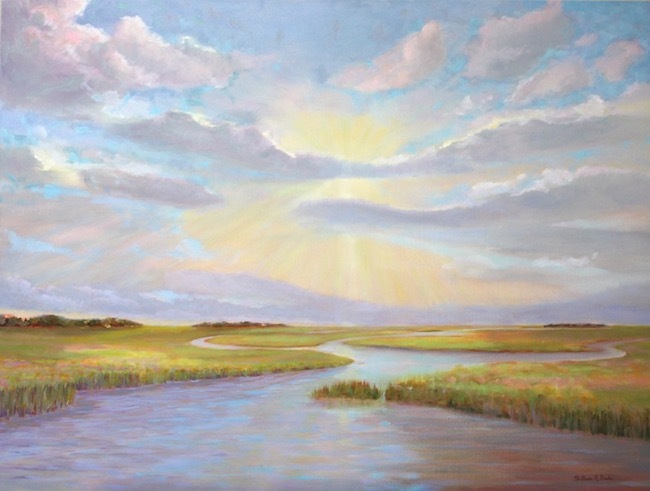 In my latest painting, entitled Lowcountry Evening Light, I set out to capture the elements I find captivating when experiencing the beautiful marshland along the South Carolina coast. With very little vegetation other than tall bladed spartina grass, marshes create a flat horizon line, often leading to an expansive view of up to 180 degrees. This simple landscape characteristic leads to big skies, often dramatic at that! I’ve become increasingly interested in studying cloud formations and the effect time of day has on them. This interest has developed from becoming more familiar with the Lowcountry marshes. I love the expansive nature of marsh scenes and the endless possible combinations of cloud formations and ever changing tidal marshes. Lowcountry Evening Light has the sun descending behind a band of dark clouds. The sun remains strong, casting rays of light over the marsh and up into the sky. The clouds closest to the sun have strong highlights along the upper edges. Clouds lighter in color are the consequence of more direct sunlight (not backlit). Ironically, this tranquil scene was started before Hurricane Florence and finished just after it. The Lowcountry was in severe danger of bad flooding. This time we lucked out and the storm turned inland instead of down the coast. Sadly, North Carolina was hit hard. We are keeping the victims of the storm in our prayers. Thank you as always for your interest in my art and for reading my journal. Please check back soon to see what’s next on the easel!